Asus has been busy with a number of product revelations over at Computex 2018, with a cluster of peripherals getting an airing for the first time, including a gaming headset, mouse, and a mouse pad with integrated wireless charging – although the mouse itself, while wireless, doesn’t support the latter technology. 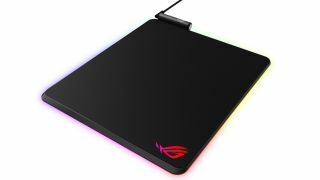 Anyhow, let’s start with the mouse pad, which is the ROG Balteus Qi, and it comes with built-in Qi wireless charging. That means you can game and charge your (Qi compatible) wireless mouse at the same time, which is pretty nifty. The Balteus Qi is a 370 x 320mm micro-textured hard surface for precise mouse movements, Asus notes, and it has 15 Aura Sync RGB lighting zones which can be fully customized to your liking. You also get a USB 2.0 pass-through port. There will also be a straight ROG Balteus version of the pad without the Qi charging capability, for those who have no interest in that. Aside from the omission of wireless charging, it’s exactly the same product otherwise. The mouse Asus revealed is the ROG Gladius II Wireless, a new wireless spin on the ROG Gladius II, offering low latency connections via either RF or Bluetooth. It comes with an included USB cable so you can plug it in and use it as a wired mouse, topping up the battery. At any rate, what the revamped Gladius II does have is a Pixart 16000 dpi sensor for accurate tracking, and that sensor has been made as efficient as possible in terms of power consumption, to give the mouse a good level of battery longevity. Indeed, with the lighting turned off – Aura Sync illumination is available if you want it – this peripheral can game for 24 hours solid, Asus claims. Finally, the ROG Delta gaming headset plugs in via USB-C and can be used across PCs and mobiles alike, benefiting from a lightweight design to allow for comfort in longer gaming sessions. The headset also has an ESS-based quad DAC array to refine the audio coming from the headset, meaning that you’ll hear a cleaner and more polished sound, whether gaming or listening to some music. This is another peripheral that supports Aura Sync RGB lighting, which can be fully customized. Pricing hasn’t yet been revealed for these accessories, but Asus says that they will be available in the second half of 2018. So potentially, that could be just around the corner. Asus has also revealed a gaming smartphone at Computex 2018, and you can view our hands-on video of it below.